Perhaps the most well-known symptom of Lyme disease is a rash that looks like a bull’s-eye. This occurs in 70-80 percent of people infected by a tick bite. The area directly around the tick bite may be red and raised and look like a normal bug bite. The rash often spreads in a circular pattern that’s lighter in the center and darker on the outer ring. However, not everyone who gets Lyme disease gets the target-shaped rash. Classic signs of early Lyme disease include: muscle aches, headache, fatigue and fever. Some people with Lyme disease experience other, more advanced symptoms of the illness. 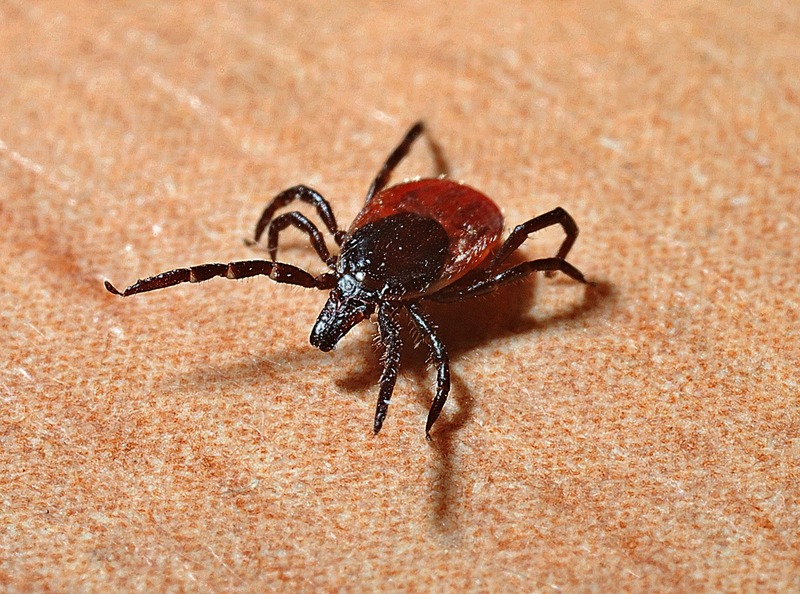 Joint pain, especially in the knees, and a stiff neck may occur in the early-symptom stage or several months after your tick bite. Severe headaches and shooting pain in your body can occur. Dizziness and changes in your heart rate or rhythm are also advanced symptoms of Lyme disease. Lyme disease is treated with antibiotics. The earlier you’re treated, the better your chances for recovery. Most people who are diagnosed in the early stages take an oral medication for between two and three weeks. -Use DEET on skin and treat clothing with spray containing permethrin. -Avoid tick-infested areas, such as dense leaves under trees. – Avoid brushing against long grasses and brush on edges of paths. Don’t sit on stumps or fallen logs. -Wear light-colored long pants and long sleeves so you can easily see any ticks. -Tuck shirt into pants and tuck pants into socks. -Do a thorough tick check upon returning inside and for several days following exposure. Symptoms can start at any time between three and 30 days after infection. The incubation period can also lead to confusion about your symptoms. If you don’t remember being bitten, you may think you have the flu and you may not connect the tick bite and your symptoms. If you’re experiencing any symptoms, contact your doctor immediately. They can administer a Lyme disease test kit, as well as blood work, to confirm or rule out Lyme disease infection. Most of us have at least heard about Lyme disease and know that it’s contracted from a tick – but that’s the extent of most people’s knowledge. In order to keep you and your family safe it’s important to know the details of Lyme disease, including what exactly it is, the symptoms and side effects , how to prevent Lyme disease and the use of Lyme Disease Elisa test kits in detection. The Centers for Disease Control and Prevention estimate that 300,000 people are diagnosed with Lyme disease in the US every year. With the exception of winter, when many, but not all, ticks are dormant, it’s possible to come into contact with a tick from spring through fall. That’s why isn’t important to be knowledgeable and aware of the risks. Lyme disease is an illness that’s caused by bacteria carried by infected Ixodes ticks, also known as deer ticks, and on the West Coast, black-legged ticks. Ticks are typically found in wooded and grassy areas. Lyme disease can affect any organ of the body, including the brain and nervous system, muscles and joints, and the heart. Lyme disease is treatable, but it can cause serious health problems if you wait too long to receive treatment. Many people with Lyme disease don’t know they have it until their symptoms are advanced. Knowing the signs and symptoms will help you to seek treatment as early as possible. To learn more about Lyme disease, continue reading our next blog post, Lyme Disease Symptoms & Prevention: Part II. It’s spring and that means we’re all headed outdoors to enjoy the sunshine, warm weather and Mother Nature. Unfortunately, it’s also the time to worry about a tiny menace known as the tick. The blacklegged tick (also known as the deer tick) can transmit Lyme disease through a single bite. Therefore, it is imperative to avoid ticks and being bitten at all costs. *Avoid tick-infested areas, such as leaf litter under trees. Avoid brushing against long grasses and brush on edges of paths. Don’t sit on stumps or fallen logs. *Wear light-colored long pants and long sleeves so you can easily see any ticks. *Tuck shirt into pants and tuck pants into socks. *Use DEET on skin and treat clothing with spray containing permethrin. *Do a thorough tick check upon returning inside and for several days following exposure. *Check bedding for several days following exposure for ticks that drop off. If a tick is promptly found and removed, the infection can be prevented. When Lyme disease is left untreated, it can spread to other parts of the body and become a chronic condition. If you find a tick on your body, use tweezers to grasp it and pull directly upward. Try to avoid twisting the tweezers as you pull so that you don’t detach the tick’s mouth and leave it in your skin. After you’ve removed the tick, cleanse the bite area and your hands with rubbing alcohol. If you have any concerns, seek immediate medical attention. A hospital, doctor’s office, or medical clinic can use our Lyme disease test kit to get you immediate answers. Enjoy your time outdoors, but always remember to be safe. 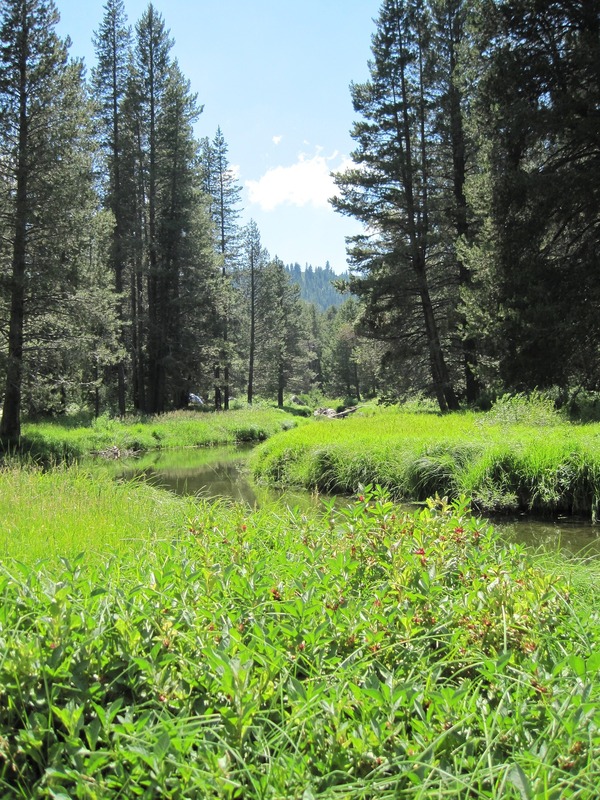 If you take the proper precautions, the summer months can be filled with good health and outdoor adventure! As the season change from colder to warmer, the threat of encountering infected ticks carrying Lyme disease increases. Active people who spend time outdoors during the spring and summer months are the most susceptible to infection. If a tick carrying the Borrelia burgdorferi bacterium attaches itself to an individual, they will have the risk of developing Lyme disease. In most cases, Lyme disease starts as a red skin rash that expands around the area of the tick bite. This bulls-eye rash occurs in approximately 70-80% of cases. Sometimes the onset of the rash can be delayed anywhere from 3-30 days after the bite occurs. In addition to the rash, early symptoms include severe headaches, painful or swollen joints, shooting pains, fever and swollen lymph nodes. It’s important to seek medical attention if any of the symptoms occur after a known tick bite. In early phases physicians can make diagnosis by finding the classic red rash, but in later stages , physicians order laboratory Lyme disease ELISA test. This Enzyme linked immunoassay (ELISA) test can detect the antibodies produced by the body after exposure to the Borrelia burgdorferi bacterium. In some instances a second confirmatory test may also be used to ensure the proper diagnosis. Once a diagnosis is made antibiotics are generally prescribed. When treated in its early stages most patients recover quickly. However, in some cases patients are left with Post-treatment Lyme Disease Syndrome (PTLDS) which results in lingering symptoms. It’s best to seek medical attention early to reduce the risk of developing PTLDS. Lyme disease may be on the increase due to global warming. Experts agree that with the increase in temperatures and rainfall worldwide, infectious agents may also be on the increase. Various insects and parasites (and in the case of Lyme disease, ticks) can be seriously affected by warmer climates. Leading scientists are predicting that there may be higher incidence of infectious diseases, such as Dengue, Malaria, West Nile, and Lyme Disease. Health officials have reported that many areas of Europe, Asia, South America, and the U.S. have reported increased Lyme disease infections in their communities. Are doctors, health practitioners, clinical labs, and hospitals prepared for possible emerging epidemics, especially that of Lyme disease? Conferences have been arranged to discuss climate change and its correlation to infectious disease, such as Lyme disease. Consider attending any upcoming event in your particular area regarding infectious disease and climate change. Lyme Disease is transmitted to humans through ticks carrying a pathogenic bacteria called Borrelia burgdorferi. Tests should be ordered immediately if a patient has been suspected of being infected. Typical symptoms of Lyme disease infection include: fever, headache, fatigue, and a skin rash. If not treated in a timely fashion, Lyme disease infection can spread to joints, nervous system, and the heart. Two commonly preferred tests are the Lyme Disease ELISA and Lyme Disease IFA – both designed to qualitatively detect antibodies present in the patient’s blood that have been triggered by the infection with B. burgdorferi bacterium. 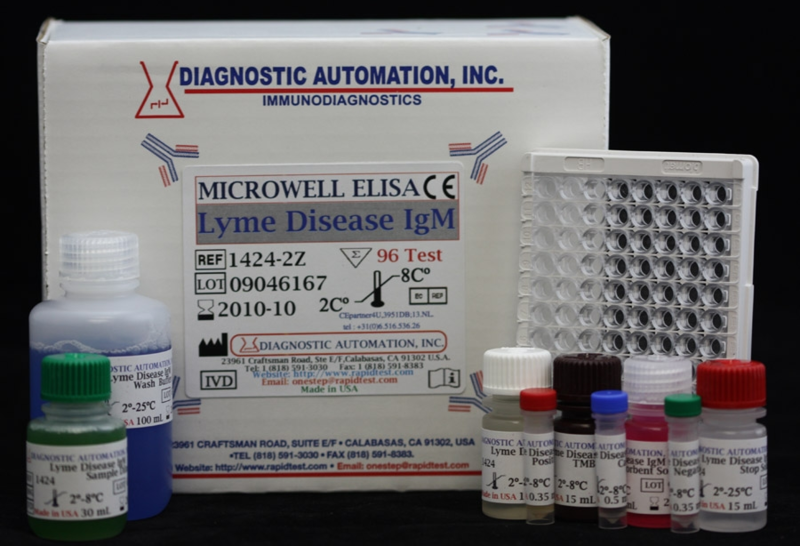 To many, the Lyme Disease ELISA test is the simplest and most sensitive screening tool to identify Lyme disease antibodies. 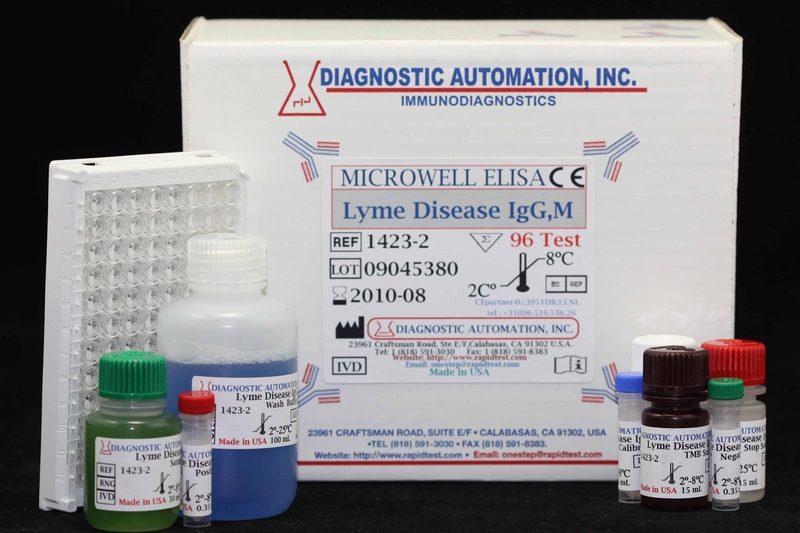 Diagnostic Automation offers three types of ELISA tests: Lyme Disease IgG, IgM, and IgG/IgM combination. If there is a recent infection, the doctor may order both an IgG and IgM antibody blood test. Special features of the Lyme Disease ELISA kit are the safe and user-friendly test preparation and specimen collection procedures, and the timely fashion in which results are obtained — approximately 70 minutes. 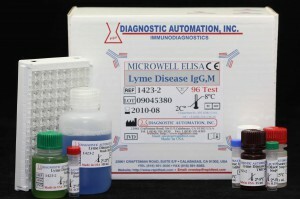 Click here for Lyme Disease ELISA Test product page. Another effective and inexpensive test is the Lyme Disease IFA test. Lyme Disease IFA tests are particularly useful for, but not limited to, the diagnosis of Lyme disease in its later stages. The system employes the Lyme disease spirochetes (B.burgdorferi) immobilized on a glass slide to bind with antibodies, while subsequently adding fluorescein-labeled anti-human immunoglobulin to cause the spirochetes to fluoresce. Refer to our Lyme Disease IFA product list for various types of IFA kits. Click here for Lyme Disease IFA Test product page. Don’t be caught short this season. Be prepared! Order Lyme Disease ELISA tests or Lyme Disease IFA test kits today. Look over our vast product line of ELISA Tests, IFA Kits, and Rapid Tests, in particular dealing with infectious diseases. Those include: West Nile ELISA Tests, Malaria ELISA Tests, Malaria Rapid Tests, Dengue ELISA and Rapid Tests, and Dengue NS1 ELISA and Rapid Tests. At your convenience, check out our main website page for a full range of available products, or call our Customer Service Representatives at 818-591-3030 to order.